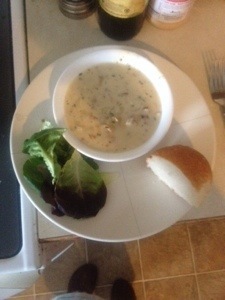 Homemade New England Style Clam Chowder! We used to live in the Seattle area, a place where any night of the week, any month of the year, you could go ANYwhere and find a good chowder, scratch that, a near perfect chowder, without too much hassle. 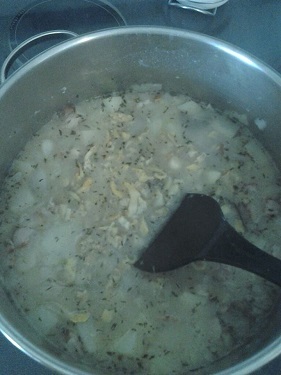 I never even attempted to make a clam chowder from scratch before, because we could order it regardless if we were eating from a place with a drive-through or a fancy restaurant. The past couple of months I decided to start my search for good New England Clam Chowder recipes. (For fans of Manhattan style, sorry, I’ve never actually eaten it! I hate to admit that, but I haven’t! If anyone can recommend a good recipe for it, I will try it though. I was raised on the creamy goodness of New England & that’s what I know. I’ve always been curious about the red sauce, just not curious enough to order it in a restaurant, my bad). When I see friends post about their recipes I ask questions, I research & compare online…the search has been long. The recipe below is the collaboration of about 3 different recipes that I have merged & tweaked into something that worked out pretty well. I used techniques from one & seasonings from another & mixed them all together & added a bit of me in there too. The family loved it & I think that you will too. Please feel free to comment below if there is anything that you would add or do differently, this was my first attempt. My point you ask? The amounts listed in the ingredients above are double what I used when I made it for my family of 5 (4+a toddler). The pictures that I took during the cooking process will look like less than what is reflected above, or you may think that I have the roomiest pot EVER. If you have a smaller family, but enjoy chowder, I would leave it & enjoy leftovers. If you have a larger family, double it! Most of us would have happily enjoyed a second bowl & were very sad, luckily we had rolls & salad…onto our chowder! First I drained my clams reserving the clam juice into a medium bowl or large Pyrex measuring cup. I looked for the highest quality clams I could find since canned were my best choice right now. Many quality natural food stores carry them too. You want to look for clams that are in their own natural juices or broth. If that is not what the label indicates, please do not reserve the juice & purchase an extra couple of bottles of natural clam juice/broth, & rinse & strain your clams a few times before it is time to put them into the chowder. 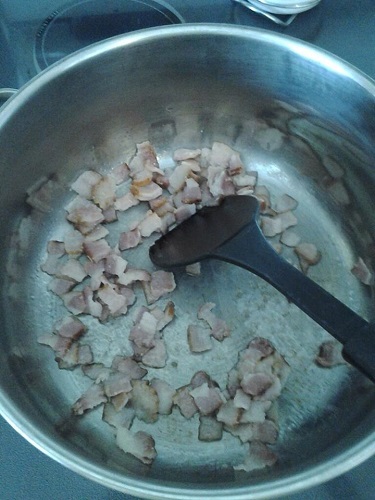 Fry the bacon in a large pot over medium-low heat until the fat renders and the bacon crisps. 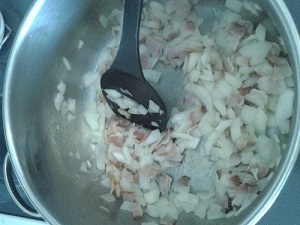 Add the onion to the bacon and saute until softened (about 5 minutes). Add the flour and stir until lightly colored (about 1 minute). 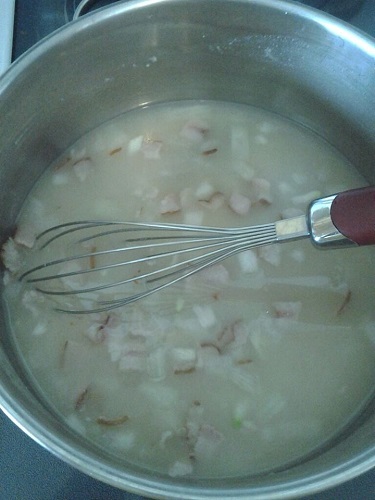 Gradually whisk in the reserved clam juice, then the sherry. Add the potatoes, bay leaf, Italian seasoning, black pepper and thyme. 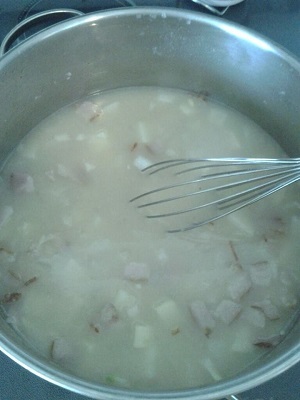 Simmer until the potatoes are tender (about 10 minutes). 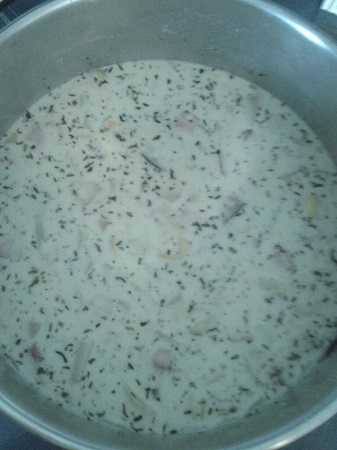 Add clams, cream, dill, and parsley. Add salt and white pepper to taste, and bring the dish to a simmer. 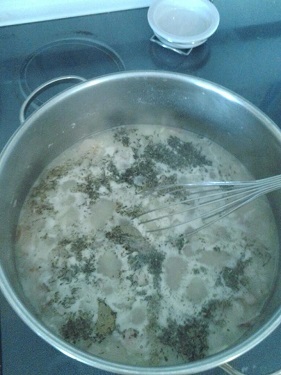 *This is where I added the roux, again some like it soupier, some like it thicker. Remove from heat and serve with oyster crackers or hearty bread.